Meshi serum - a mixture of oil extracts of various plants, along with essential oils, for nourishment, treatment and protection of dry to normal facial skin. Ingredients: Olive oil, Jojoba oil, Sesame oil, Wheat germ oil, Ylang Ylang oil, Cinnamon oil, Elaeis guineensis oil (African oil palm), Myrtle oil*, Lavender oil*, Lemongrass oil*, Peppermint oil*, Everlasting extract*, Chamomile oil, Geranium extract*, Wormwood extract*, Lemon peel oil, Cypress extract*, Linalool**, Citronelool**. **These ingredients are found in the essential oils and are not added separately. Usage: May be applied regularly on the face. Recommended to apply at least once a day, in the evening. For reddened skin, it is recommended to apply Maccabim Oil once per week. 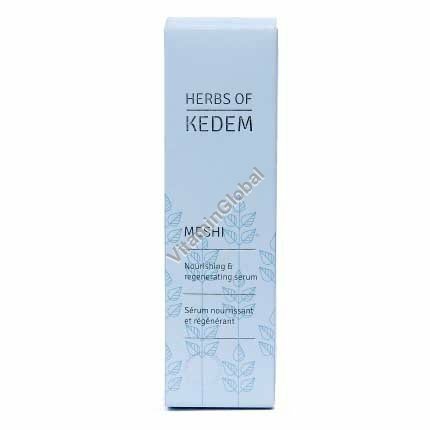 For local hyperpigmentation spots, apply Herbs of Kedem Maccabim Oil daily in the evening, following the application of the Meshi serum.